A Table to Build Community? If you have heard of the Turquoise Table Movement previous to this, I wish I'd know earlier. First off this book had the word Turquoise in it---my favorite color! And it's bright gold binding drew me to it's place on the bookstore's shelf. I read it's write up and promptly added it to my amazon list to purchase at a later date, as I already had a few books towering in my arms. Do you ever do that? Months later I ordered it and have just finished reading this beautiful story of community building and purpose in the name of Jesus. I have always wondered what happened to the good ol' days of front yard living. When kids would play in the streets in the evenings after a sweltering hot day. Parents and neighbors would sit out front on their porches and knew each other's names. Knew more than simply their vehicle color and perhaps their first name if you were lucky. All we know much of in our neighborhood is the rushing of everyone. How people stick to their yards and it's odd if you branch out and say hello. People are genuinely surprised when you speak to them. Not unhappy, just surprised. What has happened to our world? This place that we have been blessed with. I always think of that t.v. show Cheers. In the theme song they talk about it being the place where you belong and everyone knows your name. Granted it was a bar, but I honestly feel like that about the coffee shops I attend. I like knowing the people there and taking the time to meet and greet them. It gives me a sense of comfort and belonging. And honestly, who doesn't have the desire to belong somewhere? In the past the desire to need people wasn't frowned upon. I kinda get the feeling from our "I don't need you", "I can make it on my own", and judgmental if you don't society that needing others in wrong. But in reality God made us for community. To actually need each other by design. No one truly likes to be alone in this world. No matter what they say. Do I think we can all do with some alone time, sure, we all need to recharge, but I don't think living as a hermit was the purpose for us. And this book tugged so hard at these strings in my heart! Kristin Schell brings you her story of trying to find her mission field as a stay at home parent. The fact that there wasn't time or money to do BIG things, but when really she just need to put herself out there and be available. 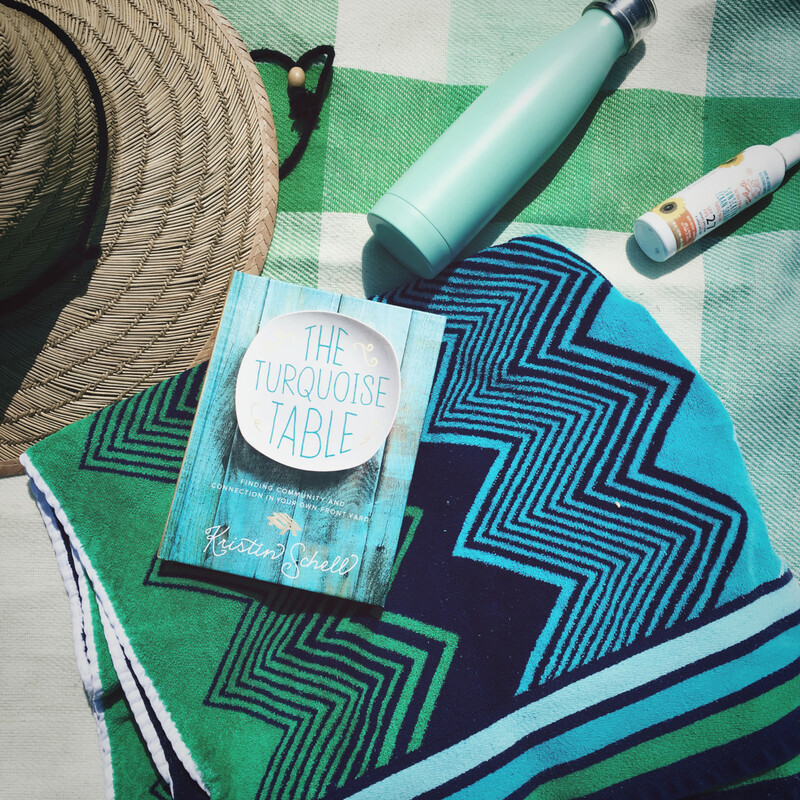 God directed her and He reached communities around the world, as well as her own, through her humble turquoise blue picnic table. In this book, Kristin adds so many beautiful recipes that I am dying to try out! The photographs are stunning and simple. She writes in a way that's really comfortable, like you came together as old friends to have a cup of coffee and catch up, is the only way I can really describe it. She also includes some great stories of other's who took on the same journey after her and they share their experiences!